Chhattisgarh Professional Examination Board (CPEB) conducts Pre-Engineering Test (PET). CGVYAPAM conducts CG PET so as to fill UG engineering and agricultural seats in the colleges and universities in Chhattisgarh. The B.E admission in the state will also be granted on the basis of JEE Main. However, only other state candidates will be eligible for admission JEE exam. The candidates can check the exam dates of CG PET from the table below. 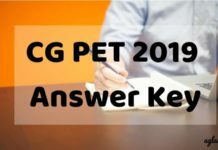 CG PET will be a 3 hours examination, in which candidates will have to solve 150 multiple choice questions. All the questions will be from Physics, Chemistry and Mathematics subjects. The total marks in the exam will 150. The 1 mark will only be awarded if the correct answer option has been chosen. 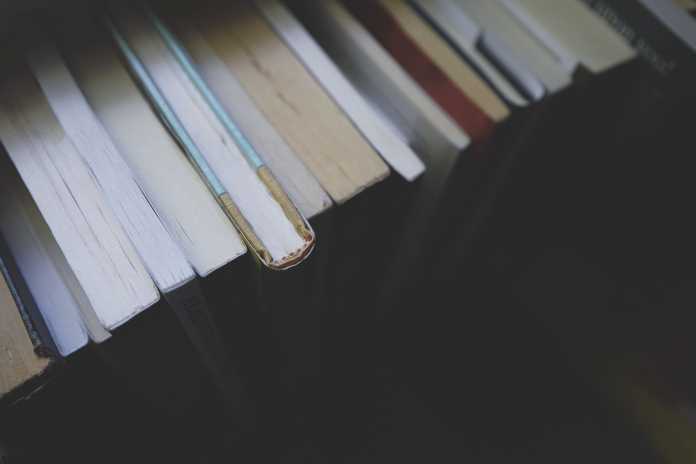 Favoring the candidates, negative marking is not applicable in the exam. The table below will help candidates in comprehending the exam pattern of Chhattisgarh engineering entrance exam better. The syllabus for CG PET includes class XI and XII level Mathematics, Physics, and Chemistry. The candidates can check it for all the subjects from here. From the previous year CG PET opening and closing score, candidates can get an estimate about the rank they need to score for securing a seat. Hence, it has been provided below for the candidates. 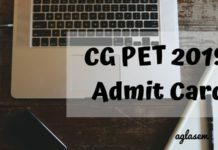 CG PET 2019 Result – Check Here!